What is the goal of Natural Movement? Why is it better than a conventional gym training? I am out of shape, older than 40, or have zero experience, is it really for me? Will it make me get fit, stronger, and leaner? What are the terms and conditions of a MovNat workshop? Does it have to be done in nature? Can I do MovNat along with other types of physical training? Will MovNat help me in my sport? How can MovNat help me recover from an injury? What is the difference between MovNat and body-weight training, or calisthenics? What is the difference between MovNat and CrossFit? What is the difference between MovNat and Parkour? 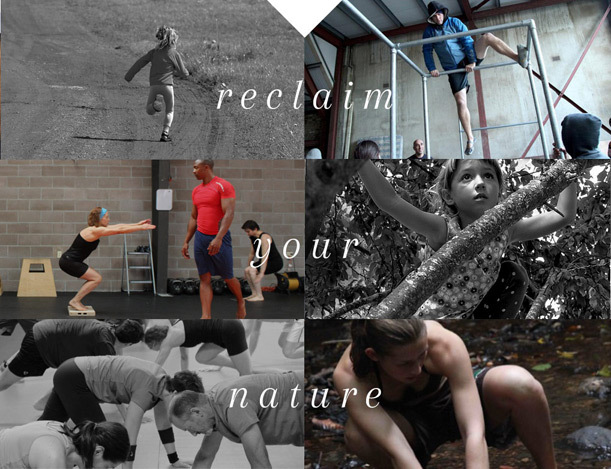 Natural Movement® is a health & fitness discipline based on the overall practice of natural human movement skills. It was defined and popularized by Erwan Le Corre as early as 2008. It encompasses the skills of breathing, ground movement, walking, running, jumping, vaulting, balancing, crawling, climbing, swimming, (and related aquatic skills), lifting, carrying, throwing, catching, and self-defense skills such as striking and grappling. The primary goal of Natural Movement is to reset people in their original – i.e evolutionary and biological movement behavior – in order to foster, restore and/or maintain health, fitness, well-being, happiness, and even a sense of freedom. Last, Natural Movement is also a mindful practice emphasizing awareness, body-mind connection, as well as a connection with Nature, and the respect of it. In a nutshell, Natural Movement contributes to the self-actualization of people so they can enjoy a greater quality of life. MovNat is the official coaching method, fitness program and certification system developed by Erwan Le Corre for Natural Movement. It is way of exercise, fitness, functional rehabilitation, and physical education. The number one reason why people don’t subscribe, or renew their membership, at conventional gyms is because they get immensely bored with machine-based drills that artificially shape their movements. They have the feeling that they must impose such mechanistic, reductionist, and repetitive fitness programs to themselves as a form of chore or punishment for being out of shape. 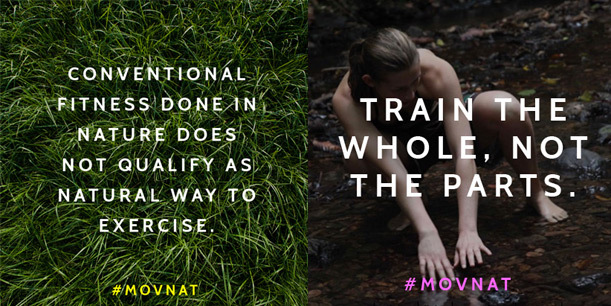 If what you are looking for is the freedom and joy of movement, as well as for a type of fitness that is 100% transferable and applicable to the real-world, then MovNat is the best choice possible because this is exactly what we are all about. Yes it is for you and everyone else for that matter, since MovNat is a coaching method emphasizing scalability, progressions, and safety. A good, concrete example could be the broad jump. You will not be encouraged to “try” to jump over a difficult or wide obstacle, but instead will first learn the fundamental technique, starting with proper landing mechanics at ground/floor level, and improve the efficiency of your movement pattern. Then you will PROGRESSIVELY increase volume (number of repetitions), intensity (distance jumped) or complexity (type of obstacle, including height, surface, or other variables). It means that you will never be pushed to do anything you are not physically ready for. Will it make me get fit, strong, and lean? Yes! Movement skills such as lifting, carrying, throwing or catching, as well as climbing and jumping, allow you to develop real, explosive strength, in natural ways that also transfer to practical situations of life. So, with consistent practice, you will become fit, strong, and lean! Also, most MovNat sessions will involve episodes of high intensity training for metabolic conditioning, which supports weight loss and will help you get very lean, especially if proper nutrition is part of your health and fitness regimen. 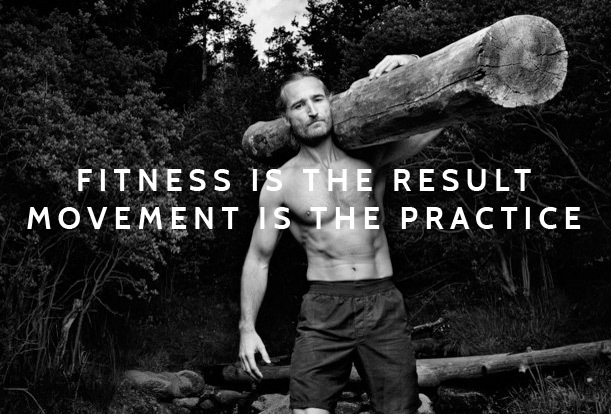 Our system for natural movement is primarily based on efficiency. Contrary to a widespread misconception, not everything “natural” is necessarily efficient. For instance, everyone can, to some extent, defend themselves and fight, but not everyone is a skilled martial artist and effective fighter, right? Maybe an even more convincing example is that everyone can breathe, but not many people are actually aware and in control of their breath. Controlled, efficient breathing can be learned through varied techniques. The same applies to every other natural movement ability. Learning from a knowledgeable trainer will help you realize your inefficiencies, and solve them through mindful, but also supervised practice. MovNat is a US-based company and all our prices are listed in US dollars. All our sales are final (workshops, certifications, retreats, etc.). MovNat does not accommodate refunds for event registrations (i.e. Workshops, Certifications, Retreats, Specialty Events, etc.). If you are a registered participant for an upcoming MovNat event, you may transfer your registration to another similar event, at no charge, if the request is made at least 7 days in advance. You may also transfer your registration to another person, if you prefer. If there are unforeseen, extenuating circumstances (e.g. sickness, family emergency, etc. ), you may transfer your registration to another similar event, if the request is made at least 24 hours prior to the event’s start date. There is a $50 processing fee associated with last minute transfers. We reserve the right to cancel any MovNat event at our sole discretion. If we must cancel an event, you will receive either a full refund or the option to transfer to another similar event. We will make every effort to notify you of any cancellations at least 2 weeks prior to your event’s date, unless there is an unexpected disaster/calamity, which renders our event and the surrounding environment hazardous to any participants. If you must book travel and accommodations prior to this, we highly recommend you purchase travel insurance. Note: For more information, please see our Terms and Conditions. Absolutely not. MovNat is taught every day around the world indoors. It is not the naturalness of the environment that makes movement natural, but the fact that it is practical and adaptable. For instance, you may train balancing on a simple board on the floor of a gym instead of having to do it on a fallen tree in the woods. The indoors provide scalability, variety and safety in a relatively restricted area, and it is also convenient when the weather is bad, or simply because most people live in cities away from nature. Practice in nature is the “purest” form of MovNat/Natural Movement, and very beneficial for both physical and mental health, but it is not mandatory. Yes. Many of our certified trainers blend MovNat exercise with their regular training classes, with great results, as it brings novelty, variety, new challenges, and playfulness to sometimes overly conventional or restrictive programs. Many MovNat practitioners come from a specific fitness modality background, be it kettlebells, other types of strength training, running and athletics etc… Because of the varied and inclusive aspect of Natural Movement, specific disciplines often feel at home with MovNat, for instance kettlebell training becomes part of the manipulative aspect of MovNat training. Therefore, it is possible to maintain separate sessions, or to blend pre-existing trainings into an overall MovNat practice. It will, especially if your sport is highly specialized. The greater the level of specialization in a sport, the greater the potential for particular physical deficiencies and imbalances (including but not restricted to lack of coordination, mobility, stability, strength etc…) pre-existing to training for the sport, or caused by it, leading to greater risk of injury. The variety of MovNat movements helps the body become overall skilled, strong, and more resilient. This is a great advantage especially when overly specific demands of a given sports create chronic stress in particular body parts, as it will reinforce the whole body, reduce physical imbalances, and help prevent injuries. Last but not least, the practice of a single physical activity can be mentally straining, and lead to lack of motivation. MovNat makes physical activity varied and enjoyable again, which in return lead to an improved appreciation for the practice of specialty activities. Most injuries stem from imbalances and particular weaknesses in the body, from an overall lack of physical activity, from a lack of skill, from inappropriate programming, including overtraining and/or under-recovery, or from an inappropriate lifestyle. While MovNat is not a replacement for therapy, it works wonder in association to therapy, as it addresses all the points mentioned above. The effectiveness of the combination explains why more and more therapists see the value of our program and recommend it to their patients, or even prescribe it if these therapists are MovNat certified trainers themselves! The notion of “bodyweight” training is based of using one’s body weight for resistance and strength development. Similarly, modern calisthenics training emphasizes muscular and strength development through bodyweight training exclusively, regardless of the practicality of the drills. On the other hand, the practice of the MovNat Natural Movement system emphasizes all practical movement skills and physiological adaptations (including strength, power, and more) associated to these skills, and including manipulative skills (such as lifting, carrying, throwing and catching) that demand resistance to an external weight. While many of the movements performed in MovNat would be considered “body-weight” training by calisthenics aficionados, our practice is not limited, or solely focused on moves using exclusively the body. Our focus is the practicality, adaptability, effectiveness and efficiency of our physical abilities. CrossFit is a General Preparedness Program (GPP) done at high intensity, and mostly draws from Olympic lifting, gymnastics, and GPP drills. MovNat, on the other hand, is entirely based on the full range of natural movement skills, and emphasizes practicality, and environmental adaptability. For example, most jumping in CrossFit is done jumping up and down from a plyobox for metabolic conditioning and with little to no emphasis on technique and movement quality. Whereas, MovNat involves many more jumping techniques, done on varied surfaces, and emphasizing efficiency and movement quality. The same goes for crawling, climbing and most other movement skills. While the range of drills in CrossFit is considered to be wide, it is actually quite limited compared to the amount of techniques taught in MovNat, and the number of drills trained. For instance, real-life, practical skills such as balancing do not even exist in CrossFit. Plus, a lot of CrossFitters must address mobility issues through specific mobility drills, whereas MovNat involves many natural movements that naturally engage, challenge and benefit overall mobility, without feeling like an extra, time-consuming chore. Don’t get mistaken, MovNat also values work capacity, and some of our training involves circuits done at high intensity for metabolic conditioning. The difference with CrossFit is our emphasis on technique, movement efficiency, and quality, ensuring not only scalability but also progressions through sound programming – making the practice less prone to cause overtraining, stress-related and/or movement pattern inefficiency-related injuries. For this reason, we are seeing a greater number of CrossFitters learn MovNat techniques and adopt aspects of our training approach. MovNat and Parkour share similar roots (The “Methode Naturelle” by French physical education pioneer Georges Hebert) and both emphasize practical and adaptable, natural movements. Parkour though is not as inclusive as MovNat – it doesn’t involve the manipulative skills of lifting, carrying, throwing, catching, or combative and aquatic skills – while also strongly emphasizing (mostly) jumping and vaulting moves, mostly in urban environments. So in comparison to MovNat, the scope of skills, techniques and movement variations covered in Parkour is reduced. 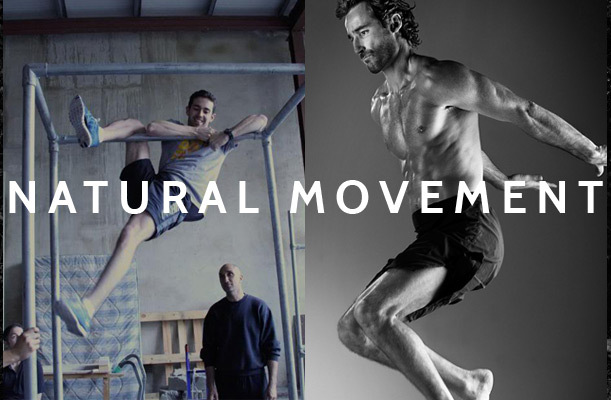 It is a fair statement to say that MovNat is a complete Natural Movement practice and method, whereas Parkour is not. 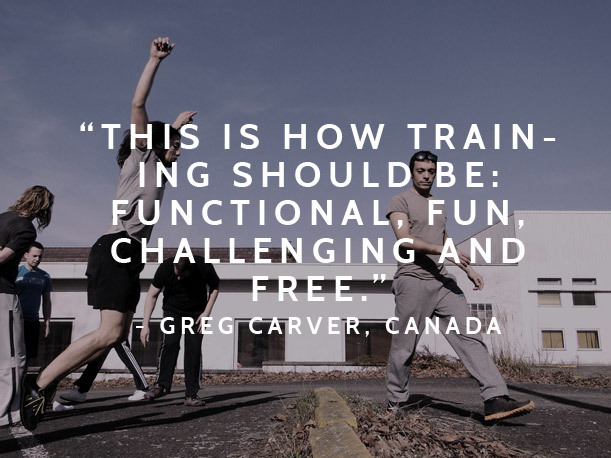 Last, the coaching methods and quality differ significantly from trainer to trainer, since there is no official or standardized coaching system in Parkour.